Join the discussion on our forums! Come discuss Shirvallah, the Tiger over in our dedicated Shirvallah, the Tiger discussion topic. Hi,everybody!There is no voice of shirvallah the tiger,if I find the voice,how do I upload the voice to the website? And many cards is not full,so maybe I can donate my little time. His name in WoW is actually Kimbul. I don't know why they changed his name for Hearthstone. 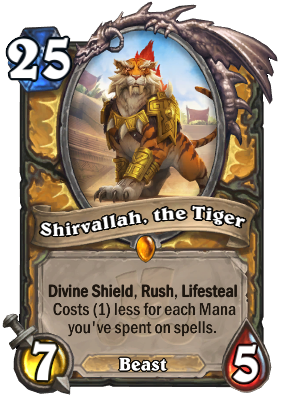 Shirvallah is a different loa. While Kimbul is a male tiger who is worshiped by the Zandalari, Shirvallah is a female tiger worshiped by the Gurubashi trolls in Stranglethorn. High Priest Thekal was her high priest in the original Zul'Gurub raid in WoW. Here is more info. Adding to the confusion is that Blizz was a bit lazy here and used Kimbul's art (you can clearly see his scars and missing eye) for Shirvallah instead of making a new one. I get this loa free and in opeing my third package I got thekal XD luck,I am planning to create a powerful Paladin deck someday. One of the most underrated cards prior to RR release. I love this card. The entrance animation is so damn cool too. wrong comment, sorry. Just delete. It says "each mana spent on spells", yet if spell is countered, it doesn't count. You literally spent mana on a spell, wether it was resolved or not. Wrong imho. Can anyone confirm if the combo with Holy Wrath works? I've been debating crafting this card for that deck, but I was curious since the cost goes down per cost of spells you cast. With a follow up question, does that impact the cost of the card when it's drawn into your hand, or is it static while in the deck as well? It costs 25 until you draw it, so it works with Holy Wrath. On launch day I got this as my free loa. After that I opened my 40-pack bundle and got Griftah and Krag'va as my legendaries. I barely play Shaman and I don't think I need to explain Griftah. I took this as a sign and instantly went to craft a deck with the kitty in it. On average, you'll play her when she costs around 3-4, maybe 5-6 or less than 3 when you get lucky with the spells and draws. 3. Have a 7-5 or more on the board that the enemy must get rid off. No spells? Well you hit jackpot ladies and gentlemen, you get another 7 or more health while he trades his dudes into her. This card is playable in any Control Paladin Deck, you don't need a bunch of expensive spells, at least 10 mana for this is worth it and only requires to play 2x spikeridged steed or Call to Arms and an Equality+ Consecration to get there. While more of a payoff for buff decks, she still does quite well as a closer for heal control. Taking out a big dude and healing yourself for a pittance (or entirely free) is just too much for many decks to handle at that point in the game, especially if you can buff her. While not a meta-defining card, Shirvallah enables a lot of really fun Paladin play.